Today in Masonic History Arthur Thomas Stewart is born in 1892. Arthur Thomas Stewart was an American politician. Stewart, who commonly went by “Tom”, was born on January 11th, 1892 in Dunlap Tennessee. He attended a private school called Pryor Institute before going on to Emory College, which is now Emory University, in Georgia. After graduating from Emory, Stewart returned to Tennessee and attended the Cumberland School of Law in Cumberland, Tennessee. He was admitted to the bar in 1913. After passing the bar he briefly moved to Alabama where he set up a law practice, before returning to Tennessee in 1915. In 1923, Stewart was elected as the district attorney of the 18th Circuit. It was in that role that in 1925 that Stewart was the Chief Prosecutor in the Scopes Trial, more commonly referred to as the Scopes Monkey Trial. The trial revolved around the Butler Act which prevented public school teachers from teaching any material that denied the Biblical account of man’s origin. John T. Scopes, who was a substitute teacher in Tennessee, was the defendant in the case. Stewart designed the prosecution's argument to preserve political control over the schools exclusively within the state legislature. This prevented the defense from turning the argument into a scientific one. In the end because of Stewart’s strategy for Prosecuting the case, the defense had no choice but to ask the jury to convict Scopes, so they could seek an appeal. The Tennessee Supreme Court did overturn the conviction, not on scientific grounds, on a legal technicality. 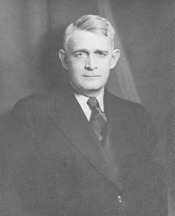 In 1938, Stewart entered a special election for the United States Senate when the sitting Senator passed away in office. Stewart was able to defeat George L. Berry, who had been appointed by the Governor of Tennessee to fill the office until a special election could be held. When Stewart won the election in November of 1938, he could have been seated immediately, instead he waited until January 1939 when his term as a District Attorney expired. Stewart was typical of the Southern Democrats of the time. The one exception was that he was a pro-Roosevelt New Deal Democrat. By defeating his Democratic opponent, Berry, Stewart was the only Senator to win a primary and defeat an incumbent Senator who Roosevelt had targeted during the mid-term election “purge” as it came to be known. After winning reelection in 1942, Stewart introduced a bill that would revoke citizenship for American-born citizens of Japanese descent. This came just after the beginning of Japanese interment. In 1948, Stewart failed to win reelection. After leaving the Senate he returned to private practice. Stewart passed away October 10th, 1972. Stewart was raised in Winchester Lodge No. 158 in Winchester, Tennessee.